Turn It Up A Notch!!! About a month back I found this on last.fm. For those of you who don’t know, last.fm is a website that tracks all the websites subscriber’s music listens across all different music listening services and programs, such as iTunes, Spotify and Rdio. At the end of 2011 they tallied up all the listeners and put together a year end list of the most listened to artists and a year in music chart to display the music listening trends of it’s listeners. The data held within the last.fm universe gives us a great look into what people are actually listening to. In the Artist’s tab you can even play around with the settings and see the music listening habits by location and/or by music genre. Try it out at the links below and see what you think of the list. Anyone you would have thought would have or wouldn’t have been on here or anyone you think deserved to be on here and isn’t or didn’t deserve to be on here? Let us know. This entry was posted in Music, News and tagged Best Of 2011, iTunes, last.fm, Music, News, Rdio, Spotify. Bookmark the permalink. I’m a big music collector. I’ve always collected CDs, which is the main reason I still buy CDs and will never buy a digital album (unless, of course, I have free iTunes money from a gift card or something). I received an iTunes gift card once and bought “The Best Of Hall & Oates” with it. I like them well enough, but would probably never buy the actual CD. I also collect vinyl records. I started collecting in 2006 and currently have a collection of 80. However I haven’t really bought many new records in the past 3 years. Too many bills!!! Eventually I’ll continue my collection. I’m also a big fan of Rolling Stone magazine. I think they do a terrific job of covering so many facets of the music world and also have great writing. They also cover other areas of entertainment as well as politics, which I enjoy reading about, as well. It is really the only magazine I read other than an occasional Entertainment Weekly. 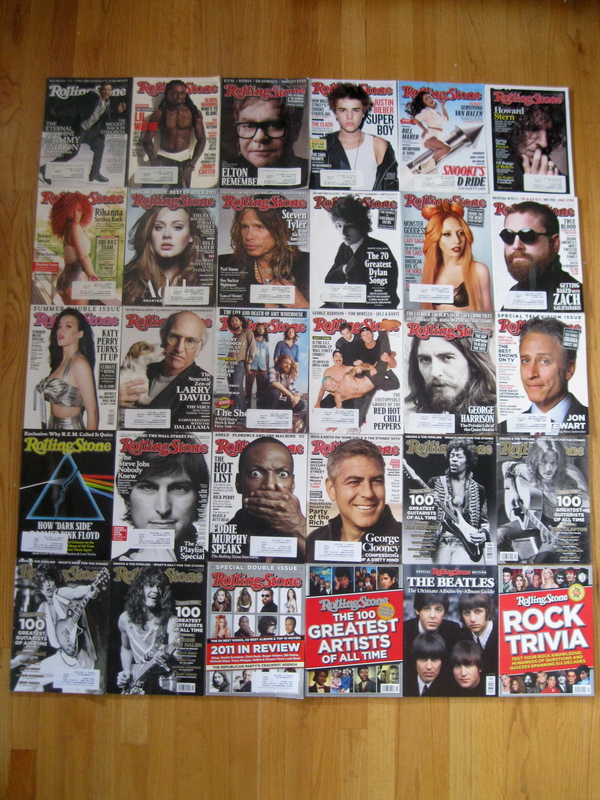 I’ve always wanted to collect Rolling Stones too, but didn’t start till October 2008, because I’m a total completist. Being that I could never collect all the past issues right up to the very first issue, I decided I’d rather have no collection at all if it weren’t complete. 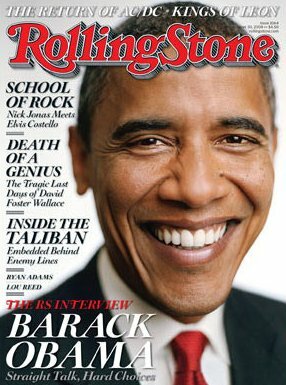 In October 2008, Rolling Stone changed the format of the magazine from the larger, more newspaper-y format to a normal magazine format. The first cover of this new format featured then presidential candidate Barack Obama. I saw no better time to start collecting than that issue. At least I could have a complete collection of the new format, right!?! Since than I’ve collected every issue, even all the covers of the issues that had multiple covers and the special issues too. The first picture of this post is all the issues, multiple covers and special issues of 2011, as collected by ME. All 30!!! 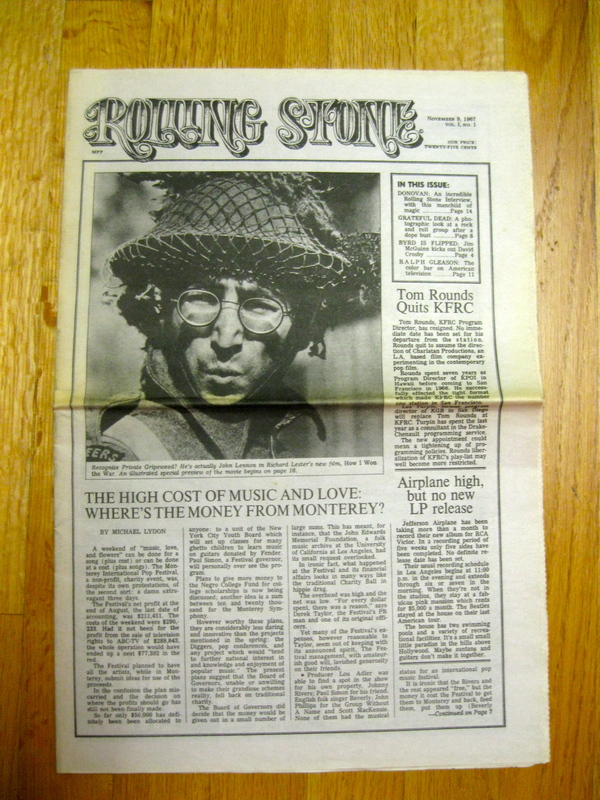 Although I abandoned the dream of owning every issue of Rolling Stone ever printed, I do have every issue of the new format and a replica of the very first Rolling Stone ever printed, featuring John Lennon on the cover. It doesn’t get much better than that for a first issue, does it!?! I was given this replica by a co-worker who knows how much I love music and collection Rolling Stones. I take a lot of pride in my music collection (CDs, vinyl records, Rolling Stones and other memorabilia). They are by far my prized possessions. I’ve spent A LOT on all of it!!! I can’t even begin to imagine how much. Do any of you out there, collect anything music related or not, that you take a lot of pride in and/or consider your prized possessions? P.S. I had a little trouble deciding what to title this post. I played around with some cheesy play on word titles. One was “Danny Collected Rolling Stones, Every One Ever Printed He Owned” (a play on a Temptations lyric from “Papa Was A Rolling Stone”. Another was “Magazines Like Jagger” (a play on the Maroon 5 song title, “Moves Like Jagger” about Mick Jagger a Rolling Stone. I decided to forego the cheese and went with the simple title of “My Collection Of Rolling Stones: 2011”. Pretty self explanatory. This entry was posted in Me, Music and tagged Barack Obama, CDs, Entertainment Weekly, Hall & Oates, iTunes, John Lennon, Maroon 5, Mick Jagger, Moves Like Jagger, Music, Papa Was A Rolling Stone, Rolling Stone, The Rolling Stones, The Temptations, Vinyl Records. Bookmark the permalink. Today’s song of the day is Jason Mraz’s ,”Make It Mine”. I just figured out today, how to link all my old iTunes listens to my last.fm account, although I’m dealing with some other issues with the slightly flawed service. With 3 years of listening data pulled out of iTunes, I found out that my most listened to song in this time period has been this song with 220 listens. When this album, “We Sing, We Dance, We Steal Things” came out, I used it’s upbeat positivity to motivate me as I graduated from college and prepared for the “real world” and also to helped me get through a tough time after my grandfather died, so needless to say I listened to this album an awful lot in that time and why not, it’s a GREAT album, one of the best of the past 10 years. Ch ch ch check it out!!! This entry was posted in Me, Music, Song Of The Day, Video and tagged iTunes, Jason Mraz, last.fm, Make It Mine, Music, Song Of The Day, Video, We Sing We Dance We Steal Things. Bookmark the permalink. The #4 artist of my top 7 artists/groups, and the only woman on the list is Kate Bush. Kate Bush isn’t for everyone and I won’t pretend that she is, but she should be. She makes such moving, beautiful music. I’ve only been listening to her music for about 4 months, but I fell hard and fast for her. In that time, I’ve listened to her songs about 700 times according to last.fm (a website that tracks your music listens through Spotify, iTunes and your MP3 player/mobile device). I started listening to her because Big Boi from OutKast mentioned on many occasions how she was one of HIS very favorite artists and biggest influences. Back in 2006, shortly after her album “Ariel” came out, I tried listening to her because Big Boi, who is one of MY favorite artists and biggest influences, said she was so great and I took his reference seriously. I tried listening to her, but I wasn’t ready yet. Her music just didn’t click with me at that time. Five years passed and Big Boi started talking about her in interviews again and she also came out with 2 albums (Director’s Cut & 50 Words For Snow) in that year (2011). So I gave her another shot and boy am I glad I did because she is simply amazing. A genius!!! My fiance who didn’t like her at first and couldn’t stand when I played her, over the past few months, is even starting to kind of like her, which makes me happy because Kate Bush makes such GREAT music and it should be shared and enjoyed by all. She is bigger internationally than in America and even still, not as widely known as someone else of her musical stature, probably because of her complete uniqueness that a lot of people just don’t get. Real music lovers and artists understand her and love her. She is an artist’s, artist. She has inspired many female artists as well as male artists in the last 30 years and will continue to as long as her music is listened to by open minds and refined ears. So share and enjoy one of her biggest hit songs, “Running Up That Hill (A Deal With God)” from her most popular and successful albums “Hounds Of Love”. This entry was posted in Music, Song Of The Day, Video and tagged 50 Words For Snow, Ariel, Big Boi, Director's Cut, Hounds Of Love, iTunes, Kate Bush, last.fm, MP3 Player, Music, OutKast, Running Up That Hill (A Deal With God), Song Of The Day, Spotify, Top 7 Artists, Video. Bookmark the permalink. Spotify is a great music subscription service that just came to America in July. It started out and exploded in Europe, so they brought it to America and it’s been taking off quite well here in the States. I use it and LOVE it!!! I buy around 20 CD’s a year, but like the opportunity to listen to an album before I buy it. Yes I buy actual, physical CD’s. I’m old school when it comes to music. I still buy CD’s and load them into my iTunes then to my iPhone. I also collect vinyl records. I have a collection of about 100 currently, but haven’t added to the collection in some time now. I don’t buy MP3. Maybe it’s because I’m a collector or maybe because it doesn’t feel like quite as special or as much of an experience if I can’t hold the album in my hands. I think it’s a combination of both. CD’s and vinyl also make me nostalgic of the days before pirated music. I think that pirating has taken more than just a financial toll on the music industry, but also a creative toll. Artists don’t have as much motivation to make great, original music anymore, because they aren’t getting compensated as well as they used to. I’ll admit to having pirated music in the past, just to have a chance to test an album out before I buy it, but it started to get too difficult to find quality files of albums, so I started looking for an alternative in the form of a subscription service where I could get quality sound files. Since I started using Spotify as my subscription service, I’ve actually bought more CDs. Through Spotify, I listen to any album I want and if I really like it, I go out and support the artist by purchasing a hard copy of the album, if I think the album is just okay, than I’ll just listen to it when I want on Spotify and if I don’t like it I just get rid of it and I don’t have to waste any money buying a CD that might let me down. 3. $10 a Month = Unlimited music without commercials and is also accessible from your mobile device so it can be used as your MP3 player. I subscribe to the $10 a month option. It’s great. I no longer use iTunes or my iPod app to access my music, although I do prefer Apple products and programs. If Apple had a similar service, I’d probably go with them, because I like how Apple products are sleek, easy to use and streamlined. But Spotify is a great service and I recommend it to everyone, weather you listen to music casually or you are a complete “audiophile” like myself. Try it out!!! You have nothing to lose. You can try the free service and if you like it and want more out of it, you can later upgrade to the paid services. This entry was posted in Music, News and tagged Apple, CDs, iPhone, iPod, iTunes, Led Zeppelin, MP3, Music, Pandora, Pink Floyd, Spotify, The Beatles, Vinyl Records. Bookmark the permalink. My Meeting With Andre 3000!